It’s not news when cars hit deer, but the Iowa Department of Public Safety, which includes the State Patrol, has taken notice of the collective damage to its vehicles from striking whitetails and other animals. That’s why the State Patrol asked an Iowa State University transportation program for assistance. ISU’s Iowa Traffic Safety Data Service (ITSDS) analyzed the locations of deer crashes and deer carcasses found along Iowa primary roads to see which highway segments are most prone to deer crashes. The State Patrol wants to someday have alert systems in their cars to inform officers when they are entering a deer “hot spot.” You could call it a high-tech “Deer Crossing” sign. 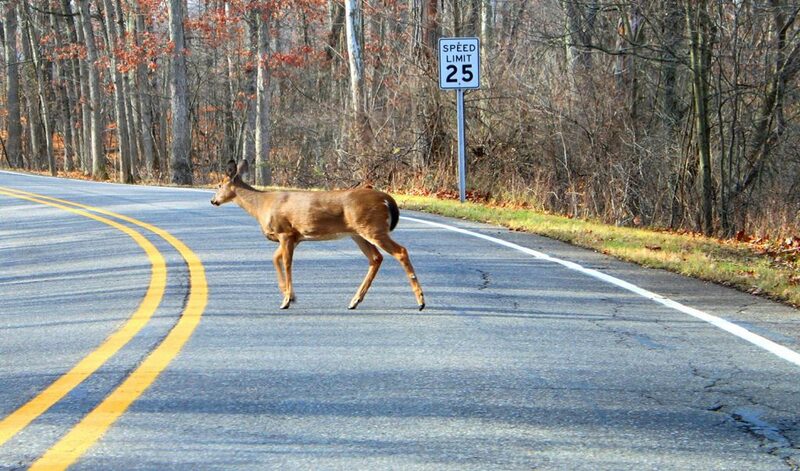 In 2014, more than a quarter of the total damage to DPS vehicles came from hitting critters, particularly deer. Human safety, of course, also is a factor and fortunately for the State Patrol, few serious injuries have resulted from deer crashes. Iowa ranked third in the nation (behind West Virginia and Montana) for highest risk of deer crashes, according to the 2015 State Farm Auto Insurance deer-vehicle collisions report. State Patrol officials hope the deer-crash data can be integrated into the MACH system, which is used in State Patrol vehicles, to warn troopers when they enter a deer corridor. MACH is Mobile Architecture for Communications Handling, software that allows public safety agencies to better communicate during routine activities and emergencies. Mapping is one of the MACH features. ISU’s Zach Hans, ITSDS manager, says the analysis used four metrics for each section of the state’s primary highways from 2010 to 2014. The metrics are the number of animal crashes (crash density) and number of roadside deer carcasses (carcass density) per mile per year, and the number of animal crashes (crash rate) and number of deer carcasses (carcass rate) per 100 million vehicle miles. Hans said the study’s data, provided by the Iowa Department of Transportation, included all animals involved in vehicle crashes, but he says nearly all of them were deer. ITSDS staff perform crash analyses for public and private groups in Iowa, using geographic information systems technology. Researchers create and provide maps that show, for example, the locations of high-crash highway curves. ITSDS services, which are free for those involved in traffic safety, are funded by the Iowa Governor’s Traffic Safety Bureau. 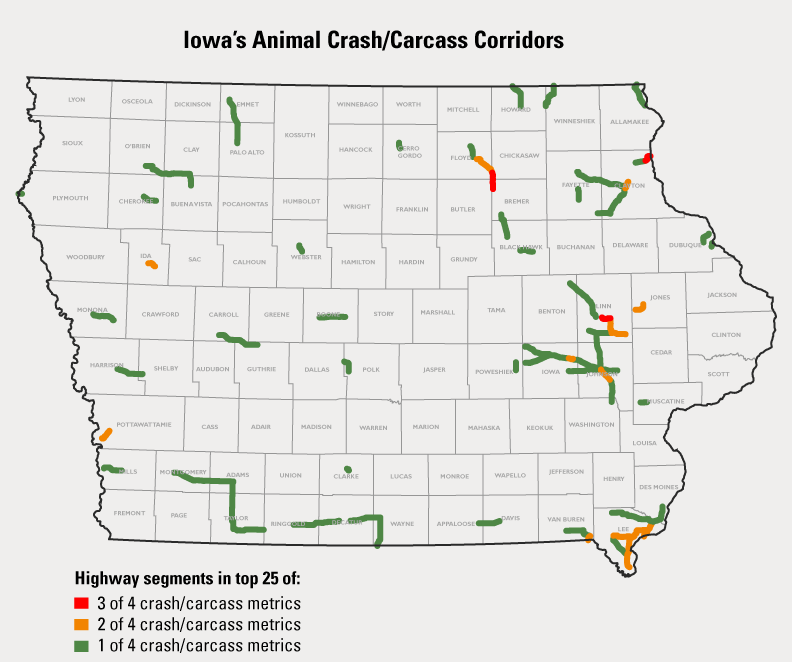 The mapping indicates the state’s top animal crash-carcass corridors are in both urban (because of high vehicular traffic) and rural (because of high deer population) areas particularly in western, southern, and parts of eastern Iowa. Col. Michael Van Berkum, chief of the Iowa State Patrol, believes Iowa is the only state that is mapping roads with the highest likelihood of deer crashes. Up to now, the state’s only animal strike mitigation effort—other than reminding officers to be watchful for whitetails—has been car-mounted deer whistles, the success of which is up for debate by many drivers. The Iowa Traffic Safety Data Service is part of the Center for Transportation Research and Education, administered and located at ISU’s Institute for Transportation.